Community Services organisation and aged care provider, Baptcare has two buildings at its Brunswick site – one housing its Community Nursing Service and one for its Sanctuary Program. The Community Nursing Service provides a range of nursing, personal care and podiatry services to residents of the City of Moreland in their own homes and podiatry services at the Brunswick clinic. The Sanctuary program provides transitional accommodation for people seeking asylum while they await the outcome of their protection applications. The Community Nursing building is old and was very draughty, while the Sanctuary building has very high energy needs for the 27 residents. Liam Henderson, the Sustainability Coordinator at Baptcare wanted to improve energy efficiency and comfort in the buildings. Saving money and reducing environmental impacts was a priority but ensuring that staff, clients and residents are comfortable in the buildings was also key. “Baptcare seeks to work with those most vulnerable in our community, regardless of race, age, gender or religion. This includes providing shelter, food and care to people seeking asylum and serving the older population in the Brunswick area,” said Liam. 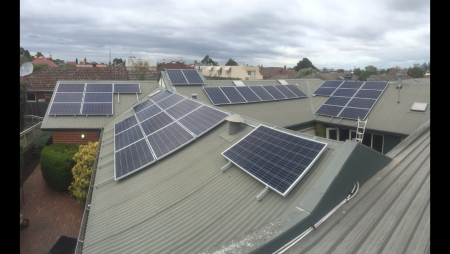 A 10kW solar PV system was installed on the newer building to help power the many computers, mini fridges and washing machines used by the residents. A grant from Yarra Valley Water helped to install water efficient shower heads in the ensuite bathrooms and replace old washing machines with more water and energy efficient ones. There are also plans to improve insulation in the building. The older building is used by staff and aged care clients. The building was very draughty and cold in winter. The waiting areas were especially cold. Liam heard about Positive Charge through Moreland City Council and contacted us to see if we could help. We put our chosen draught proofing and insulation supplier in touch with them and a thorough assessment of the building was conducted before recommendations and quotes were issued. The top priority was to seal up the building. There were some big gaps around doors, windows, vents, and fireplaces which the supplier has now sealed up. Staff have already noticed a marked improvement in the warmth of the building and are really impressed with the high standard of work. As part of their initial assessment, the supplier also picked up issues with the central heating ducts; and advised that the rubber-insulated wiring be upgraded prior to installing ceiling insulation. “They helped us identify issues out of their scope that we are now able to address. They made us aware of the issues and advised us how to act for getting the best and safest outcome. They weren’t just trying to make a buck. They were acting with our interests in mind,” said Liam. Baptcare is now in the process of upgrading these electrical and mechanical services, and once complete, insulation will be added to the ceiling and the ducts to further improve energy efficiency and thermal comfort. Recommendations were also made for secondary glazing which could be implemented down the track with the savings from the other efficiency measures. Positive Charge will be providing further support to Baptcare to help their clients and staff with energy efficiency.